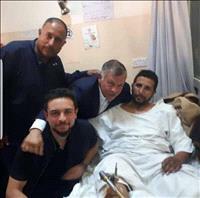 AMMONNEWS - His Majesty King Abdullah II, the Supreme Commander of the Jordan Armed Forces-Arab Army, on Sunday, visited a number of servicemen who were injured in a major raid against a terrorist hideout in the northwestern city of Salt. His Majesty the King, who was accompanied by His Royal Highness Crown Prince Al-Hussein Bin Abdullah II, was briefed by Director-General of the Royal Medical Services, Maj. Gen. Mo'ain Habashneh and army doctors on the medical conditions of the injured and the treatment they are receiving. His Majesty voiced pride in the sacrifices of army and security agencies personnel while defending the homeland's security and stability. He wished the injured a speedy recovery, and gave orders to provide them with the highest level of medical care.